Russia is monitoring the developments in Armenia, Russian President Spokesperson Dmitry Peskov said on Wednesday. 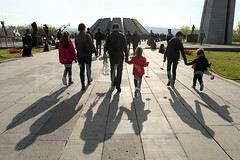 His remark came in response to the question whether Moscow was keeping an eye on the protests in Yerevan, Tass reported. According to Dmitry Peskov, on Tuesday Russian President Vladimir Putin sent a telegram of congratulations in connection with the election of Serzh Sargsyan as Armenian Prime Minister, and later they had a phone call. "We are monitoring the developments in Armenia, and above all we hope that things will unfold within the framework of law," Peskov said. 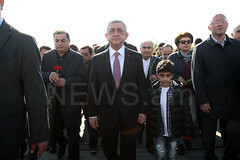 On Tuesday, the National Assembly elected Serzh Sargsyan as the Prime Minister of Armenia. The head of “My Step” initiative, MP Nikol Pashinyan urged his supporters to block departmental buildings, roads and highways. Also, he noted that they will form a revolutionary committee that will coordinate all actions, and they will begin the second phase of their actions on Wednesday. “Tomorrow, the entire city of Yerevan will be paralyzed,” he added.